Originally published June 13, 2014...but as true as ever! My business partner, Bob Gordon, just called my attention to a story that recently appeared on the online publication TheCuttingEdgeNews.com*, titled "Corn Based Ethanol Hits A Figurative Wall." The story was written by Steve Baragona, a science and health reporter for the Voice Of America. As an aside, I'm sort of puzzled as to why Mr. Baragona chose to bother writing this story, even though it's relatively short length must have taken no more than a few minutes to compose. If I wanted to be really suspicious I would say that he must have received a missive from someone in the oil lobby that said they were paying a few hundred dollars to anyone in the media who wanted to write something negative about ethanol. And with the advent of summer, he figured it would be nice to have some extra walking-around money. However, I hope he only tackled the topic because he or his editors felt it was news-worthy. In any event, whatever the reason for the story, the headline as well as the negative comments about ethanol are incorrect; that's why my headline states that the "figurative wall" is a fictional wall. The essence of the ethanol blend wall argument posed by Big Oil is that with the decline in gasoline usage in America (due to improved engine MPG and less driving) that government regulations calling for increased national ethanol usage can't be safely met. And the reason that the increased national ethanol usage can't be safely met - according to the oil lobby - is that the only way to comply with the Federal regulations is to increase the blend level of ethanol in every gallon of gasoline, which they claim can damage a vehicle's engine. The claim is, for all practical applications, false. Using this claim to force the continued reliance on gasoline as our primary engine fuel is a lie. Every vehicle manufactured for American roads since the mid-1990's can safely use gasoline-ethanol blends higher than 10% (E10). In fact, they can use blends that are substantially higher than 10%; they can use blends as high as E85, without being flex fuel certified. And since the overwhelming number of gasoline-powered passenger vehicles on the road today were manufactured after the mid-1990's, this means that the blend wall issue is a non-issue. Government tests have proven that E15 fuel is safe for all vehicles manufactured after 2001. Moreover, the government tested E20 and found that there is no difference in the results. Ricardo Laboratories, the world's most prestigious private fuel testing lab, concluded that E15 was safe in automobiles manufactured since 1994. 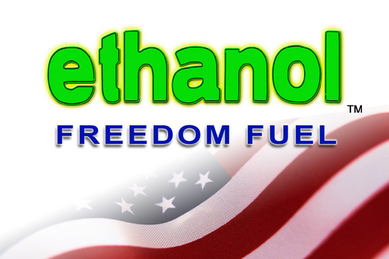 Consequently, we can safely accept and use much, much more ethanol. To read more about the EPA and Ricardo tests CLICK HERE. In addition, as I have written on many occasions, I own a 2002 non-flex Ford Taurus that I run on high ethanol-gasoline blends without any damage being done to the engine or fuel pump. I have run the car exclusively on E85, although I typically run it on a E30 to E40 level. The reason I run the car on this average blend level is because sometimes I am in areas where I can only purchase E10 regular gasoline so that when combined with the E85 already in the tank, it tends to average out to the E30 to E40 level. When I do fill up at a service station that offers E85, I "splash blend" it with E10 to achieve the E30 to E40 level. The reason I do this is because I have found from trial and error that this level will not cause my check engine light to illuminate. Like most people, I'd prefer to not have a red light on my dash, even though I know that it is simply illuminated because my engine's computer has detected that the fuel is different and not because there is any catastrophic problem. While my results are anecdotal, these results have been universally mirrored by other objective owners of late model non-flex fuel automobile owners who have used E85. In June 2013, I completed and published a 58-page report on "Gusher Of Lies," a book written by Robert Bryce. This book incorporated virtually every lie and gross distortion used by the oil industry to bash ethanol, including the food vs fuel arguments. The book was hailed as a watershed effort in revealing the evil truth about ethanol and the alt fuel industry. As my report shows, the only gusher of lies were those that streamed from the pages of Bryce's book. I made Bryce aware of my findings and he has never responded or challenged them. My entire report is available by CLICKING HERE. *TheCuttingEdgeNews.com is published by a good personal friend, Edwin Black. I am a frequent contributor to his publication, and he to TheAutoChannel.com.